This is a 10 x 6 Waltons overlap shed with a reverse apex design included. You have a building here that looks amazing, but also has some features in it that allow it to look after your tools and equipment all year round. First of all, there is overlap cladding, which literally overlaps, preventing rainwater from entering the building. There is also solid sheet board included in the floor and the roof, so you have two aspects here that make for more strength and durability. The reverse aspect of the building also allows for more flexibility as regards positioning in the garden. Well it is certainly pretty huge! Is probably the first thing that comes into your mind when you step back…… way back to see this epic shed you have just built! This is just such an impressive looking shed as “dramatic” as this sounds it looks more like a full on building than it does just a regular shed. This is a shed that just has an high quality look to it all around. The apex roof looks very impressive and while it is not any more at an angle than a typical apex shed roof is. As soon as you look at it, you know the water is just going to run right off it, which when you are keeping your belongings inside is a good piece of mind to have. The window on this shed is 2.5 mm thick styrene and as well as being strong we love how it is slightly wider than the normal size of window you would see on a smaller shed. When we first take a look at a new shed the first two things that come into mind 99/100 (with the 1 being “who on Earth built this????) is how strong is this bad boy and how much stuff can we cram inside! 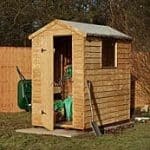 Well this is a shed that looks very impressive and thankfully it is very sturdy when built properly which backs up its “tough guy” image that it has going on. Also before you even go into the shed your mind will be racing with all the stuff you can store in here……… and so will you other half so be sure to fill it with your stuff first! Hey while some people are ok with being told “shed is big and strong” and that is all they need. For you guys we have a few more detailed specs to let you know a little better just exactly what you will be getting for your money. As you can see this is a very large shed that is going to be up to the task of storing what you need. The single door may seem a little on the small side for a shed of this size, but we are sure you will be able to “dance” in pretty much anything you could want into this shed. 10 x 6 Walton’s Reverse Overlap Apex Shed: How easy to build? This is a reverse style shed (it is in the title after all) and not only that, but we are talking about a ten foot wide reverse shed here. While some DIY experts will no doubt be able to slap this together in no time at all….. and make us feel bad in the process. Us regular mortals will need a little help so before you start be sure to offer a friend a cup of tea and a few chocolate biscuits for some help putting this together. Your 10 x 6 Walton’s Reverse Overlap Apex Shed will be delivered to you flat packed which at first when it is all laid out on your garden floor can look pretty scary, but everything is labelled well enough and as long as you follow the instructions and make sure you have all your screws and whatnot organised then in 5-7 hours you will be standing in front of your amazing new shed. We will never lie and tell you this is very easy to build, but by taking your time and having fun as you go will ensure you have this built safely and properly. 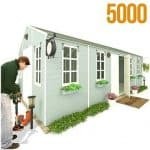 10 x 6 Walton’s Reverse Overlap Apex Shed: How Safe & Sturdy Is The Shed? We already said that this was a very impressive looking shed, but boy is this one tough cookie also! 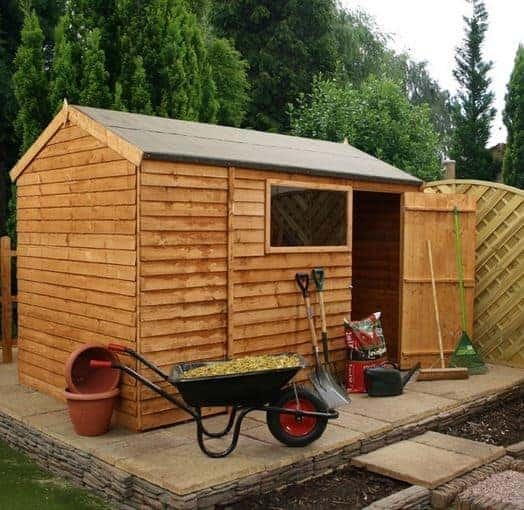 This is a shed that is built to last and with its overlap cladding there is no way that any water is getting in here so all of your items will be kept nice and dry inside. As well as this we all know that kids in the garden seem to get some kind of enjoyment kicking balls of the shed or just running into like some kind of wild animal. Well the cladding is 8 mm thick which is very respectable….. and tough! The floor and the roof is made with solid sheet board. With the flor being 10 mm thick which is strong enough to hold your mower, tools or whatever. The roof is 8 mm thick which along with the sand felt will keep the rain away and even look very nice when the snow is sitting on top in the winter. We already talked about the 8 mm thick overlap cladding that this shed is made from and while that is strong on its own there is also some very thick, durable and tough, double framed corners. This means that the shed is even stronger it is like the overlap cladding and these framed corners are some kind of wrestling tag team! You can give this shed a smack with your hand to see if it moves or shakes a lot, but we can tell you all that will happen is your hand will hurt! When built properly, you really do have one fortress of a shed here! 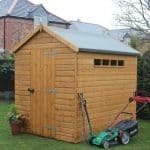 10 x 6 Walton’s Reverse Overlap Apex Shed: What Is The Guarantee Like? We really love it how Waltons gives people a ten year guarantee with their sheds. It shows just how confident they are in their work and it gives the buyer confidence in their purchase as well. 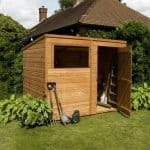 However this guarantee only comes into effect if you treat your shed with wood preserve or some kind of protective paint, but to be fair this is not a huge deal and will only make your already beast of a shed that little bit more stronger. 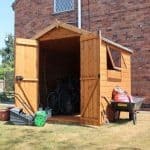 The 10 x 6 Walton’s Reverse Overlap Apex Shed really is a fantastic shed that for under £400 offers a pretty vast storage space, looks very impressive and will serve you well for many years. 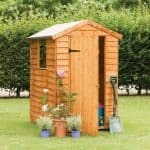 In all we are very impressed with this shed and think it would make a great addition in any garden.